Lewis Kuhn Swan PC has established a proven record of success in cases that demand exceptional legal knowledge and advocacy. Having recovered tens of millions of dollars in verdicts and settlements on behalf of our clients, our attorneys have demonstrated the experience, skill, and resources needed to handle the most complex cases. If you are involved in a dispute with an employer, insurance company, or law firm, you may already have a team of lawyers building a case against you. 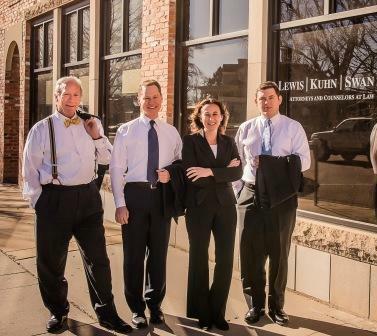 Call Lewis Kuhn Swan PC today at 719-694-3000 to speak with an experienced attorney. We welcome clients from Colorado Springs, Pueblo, Castle Rock, and throughout the state. Employment law: As an employee, you are protected by a number of state and federal laws against mistreatment in the workplace. Our firm is experienced in matters of wage and overtime disputes, medical leave, employment contracts, severance packages, DORA complaints, and more. Insurance bad faith: Is an insurance company unfairly handling your claim? Our attorneys understand the tactics insurance companies use to try to delay, diminish, or deny claims in order to protect their own best interests. We can help you get the payment you deserve. Legal malpractice: We take pride in providing exemplary legal representation to our clients, and we take it personally when other lawyers treat clients unethically or incompetently. If your lawyer has grossly misrepresented your interests or failed to handle your case and timelines effectively, call us right away to discuss your legal options. Whistleblower: Your employer cannot retaliate against you for reporting instances of fraud, discrimination, wage disputes, or safety violations. Our firm provides skilled legal counsel to employees filing various types of whistleblower claims. Appellate practice: If you have initially lost your case in a trial, you may appeal your case to an appellate court. Our knowledgeable appellate attorneys advocate cases before both federal and state appellate courts. Probate and estate law: Our firm can help with matters of probate and trust administration, estate planning, guardianships and conservatorships, Medicaid planning, veteran’s aid and attendance pension, and special needs planning. We are highly respected by our peers and recognized as one of the most highly-awarded legal firms in our community. While many prospective clients seek our services because of our distinguished credentials and proven history of success, it is our unwavering commitment to our clients that truly sets us apart. Contact us today to learn how we can help you. At Lewis Kuhn Swan PC, we are passionate about justice. When we accept you as a client, we see more than just the facts of your case and the laws that apply to it; we see a person with real worries and challenges. We know you need more than just our legal advice; you need us to be there for you, to answer your questions, and to be honest with you. We win cases, but our focus is on you and what you need at every step of the legal process. You deserve our very best efforts and we are committed to giving you nothing less. Our dedication shows in our results, having obtained tens of millions of dollars in verdicts and settlements on behalf of our clients. We are proud of our exceptional record of success and never represent clients in whom we don’t fully believe. It costs you nothing to call us to discuss your situation. We’ll listen to your side of the story and tell you if we believe you have a viable case. If you live in or around Colorado Springs, Pueblo, or Castle Rock and believe you’ve been wronged by an employer, attorney, or insurance company, call Lewis Kuhn Swan PC today at 719-694-3000 to speak with an experienced and compassionate attorney.